I can't believe our baby boy will be 6 months in two weeks! Everyone asks me if time is flying by, and I'm always torn. The days seem to last longer than usual, but time as a whole is definitely going by too fast. It seems like just yesterday he was being taken home from the hospital. Although I miss our little 6 pound baby, I'm having so much fun with him hitting a ton of new milestones. Holding up his head, giggling, playing with new toys, standing and sitting with support...it's all so exciting! 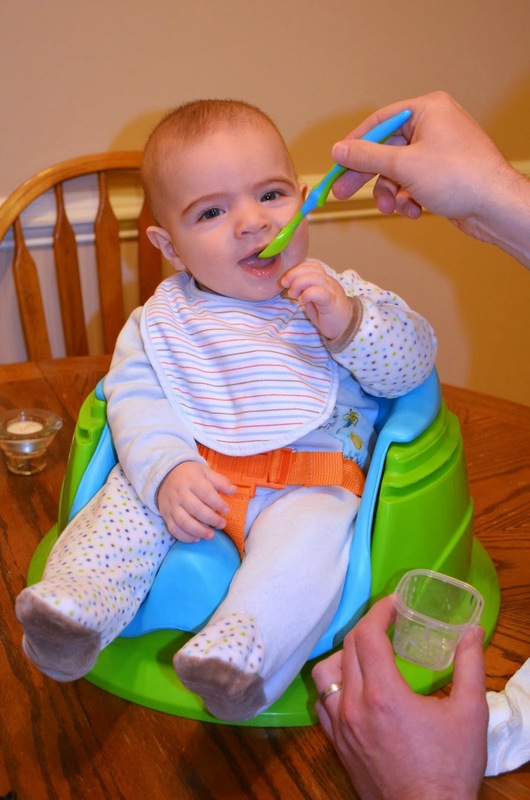 And now we're on to a new phase: solid foods!! 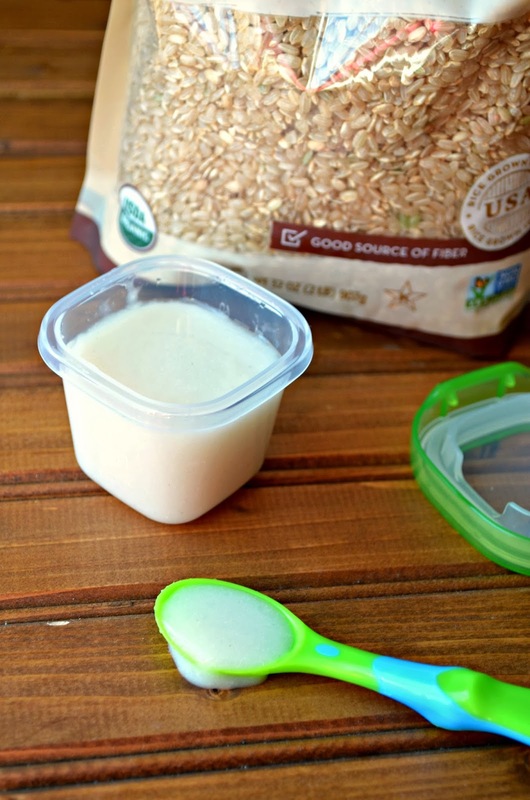 We started with homemade organic brown rice cereal and he definitely enjoyed it. 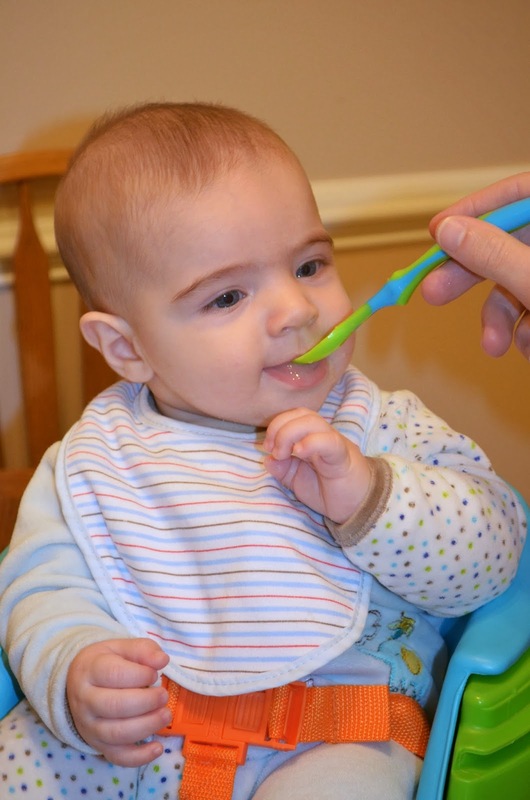 Please consult with your pediatrician before feeding your baby any solids, though! Up next: oats! In a food processor or Baby Bullet (or anything that has a milling blade), add rice and grind to a fine powder. It usually takes about 5 minutes in a food processor. Add the rice powder to a pot with the water. Whisk so it doesn't clump. Cook until it boils, then cover and turn the heat to low. Cook for 20 minutes or until it reaches the consistency you want (should be a little thinner than applesauce). If it clumps, use an immersion blender to thin it out. Pour the cooked cereal through a sieve to remove any lumps or chunks of rice. Allow to cool then serve to your baby with a spoon. I recommend adding some breast milk or formula to the cooked cereal as well...this thins out the cereal and adds a flavor they already know and enjoy. If saving for a later date, pour it into storage cups to freeze or refrigerate. You can refrigerate up to 3 days or freeze for 30 days. Make sure you label your cereal! Once you are ready to serve, heat the refrigerated or frozen cereal up in the microwave and allow to cool to just warmer than room temperature. Add breast milk or formula to thin it out. 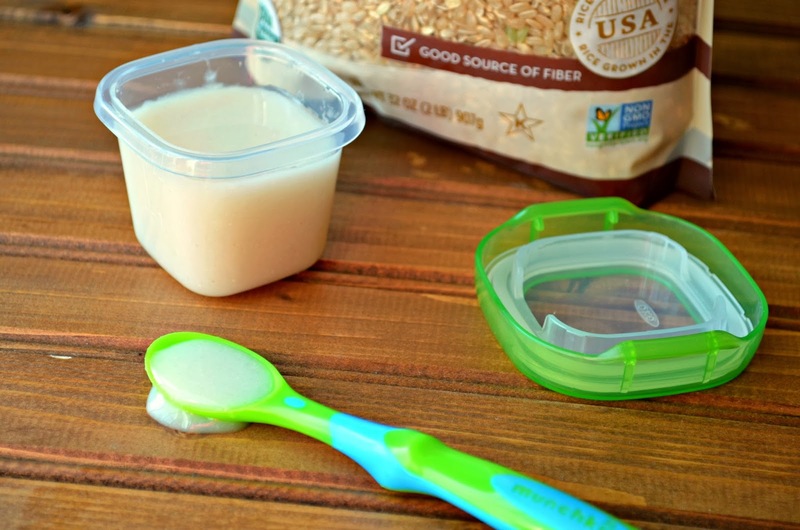 Tip: You can grind up extra rice and store it in an airtight container for future use. *Consult your pediatrician before feeding your baby solid foods and to see what amount/type of food you should give your child.